Franklin Street Gym on Monday. Neither do you. was exponentially more angry than this words. So do yourself a favor and avoid the Franklin Street Gym area. I have a sneaky feeling several rooms will need repainting. the game teetered between a 12 and 20 point lead. They are now 1-8 for a reason, and that reason is their defensive intensity and awareness–which, by the way, is what caused Shaka Smart such great annoyance and displeasure. Still, anything that gets Buzz confident in his shot is good by me. was a tepid affair after VCU jumped out to the quick double-digit lead. Daniels found himself wide open on the left wing. Wide open. Wide. dear life, ODU grabbed a rebound and sprinted into the offensive end. order. It would be ODUs last charge. side of the line–the line between effort and edge. 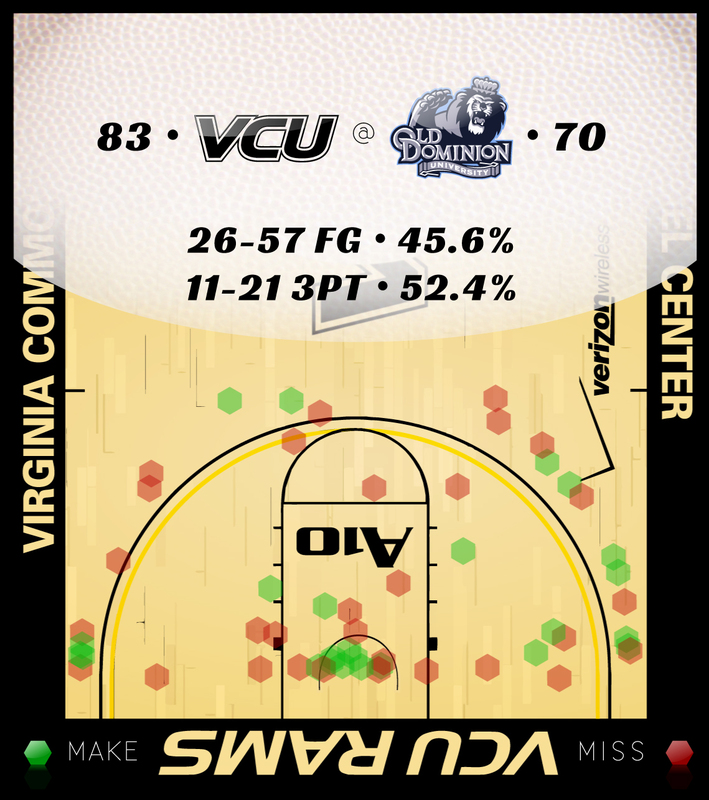 It does not mean VCU fans have to root for ODU in order to help the RPI number. VCU fans need to sort that one out on their own. assists, one disputed turnover, nine rebounds, and five steals? terrible starts to second halves are making more sense to me right now. tenuous 15-point lead in VCU history. attacking even with a big lead. They just lacked that edge for some reason. scoring 24 points. Love that. But inside that was how he got there. took those five shots in the game's first six minutes. Daniels came out of the tunnel determined to shoot through his slump, and his aggression was rewarded. puts his saliva-filled mouthpiece on the towel and re-inserts his gum. This happens over and over and over, including at halftime. Six times on Friday. The kid can't even allow his teeth to rest. his game, but I'm trying to find an area in which he is weak. Dandruff? offense, Graham went to the basket and produced points.